Fluoride is a common mineral that is found all throughout nature, including within many food and water supplies. Humans have understood the valuable oral health benefits of fluoride for many years now – that’s why we’ve added it to our community water supplies. Countless studies have shown that regular exposure to fluoride greatly benefits growing teeth, resulting in stronger enamel and fewer instances of cavities on average when compared to patients who did not receive that exposure. 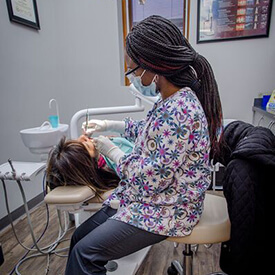 At Roselle Park Dental & Implants, we offer professional fluoride treatment when needed to help children and adults alike enjoy healthier, happier smiles. Please contact our Roselle Park, NJ location today to schedule your first appointment, or if you have any questions for our doctors and staff members. Topical fluoride is directly administered to the tooth surfaces, where it seeps into the enamel and helps make the teeth more resistant against the threat of cavities. Topical fluoride can be gained by using quality dental products like fluoridated toothpastes and mouthwashes as a part of your personal at-home oral hygiene routine. Additionally, our team can provide professional applications as an essential part of routine checkups and cleanings for young patients. Systemic fluoride works to strengthen both erupted teeth and teeth that are still gradually developing beneath the patient’s gum line. This form of fluoride is the kind that’s found in water supplies and foods, and our team can prescribe it in drop and tablet form for children. We will monitor your child’s fluoride levels over time to ensure that they’re safe and beneficial – too little exposure or too much exposure can result in adverse consequences.